Welcome to Communication Matters. Communication is paramount in business. Most of the times a customer is unhappy or an important business deal falls through because of communication. Communication is an important skill to master, very very important. 07 Dec 2006 Who is a Compassionate Listener? With Others In a More Powerful Way. You're 35 Minutes Away From Being a Great Communicator, 100% Guaranteed". 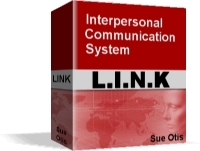 Founder, "LINK System of Interpersonal Communication"